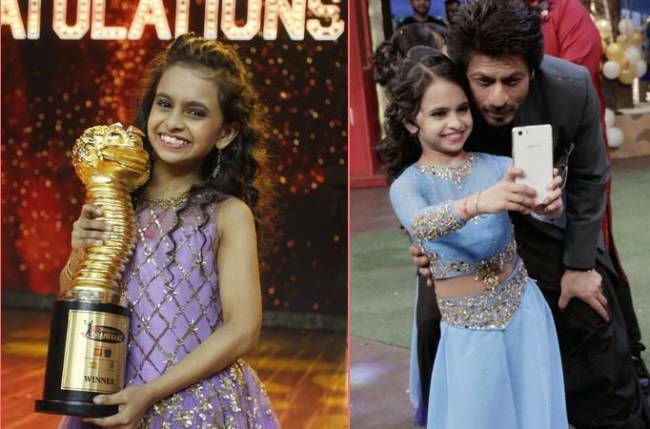 MUMBAI: Dipali Borkar, who has won the third season of children’s acting talent hunt show India’s Best Dramebaaz, considers actors Shah Rukh Khan and Madhuri Dixit Nene her role models. Hailing from Pune, the 10-year-old says she watches Madhuri and SRK’s movies to learn acting. Dipali was declared the winner of the show on Sunday and walked away with the golden trophy and a cash prize of Rs 500,000. “I love watching Madhuri mam and Shah Rukh sir on screen. Whenever I get time, I watch their movies and observe their acting in order to improve myself. I hope in future I achieve success like them,” Dipali told a publication. The glitzy grand finale saw the presence of actor Ayushmann Khurrana, who was there to promote his latest release Andhadhun. Dancer and TV reality star Shantanu Maheshwari lent a dash of fun and humour as host. Comedian Kiku Sharda also appeared in the final episode as he performed a special comedy act, eliciting loud approval from the audience and finalists. “After working day and night, I have finally won the show. I am happy I have made my family proud,” she said. Having started her career at a very young age, Dipali has performed in TV shows like Peshwa Bajirao and Super Dancer, Dance Champion. She is currently studying in Class 7. How did she manage her studies while shooting? Apart from winning cash prize and goodies, Dipali has been signed by Omung for his film. Next Next post: Karanvir takes Salman’s suggestion seriously, fights back!